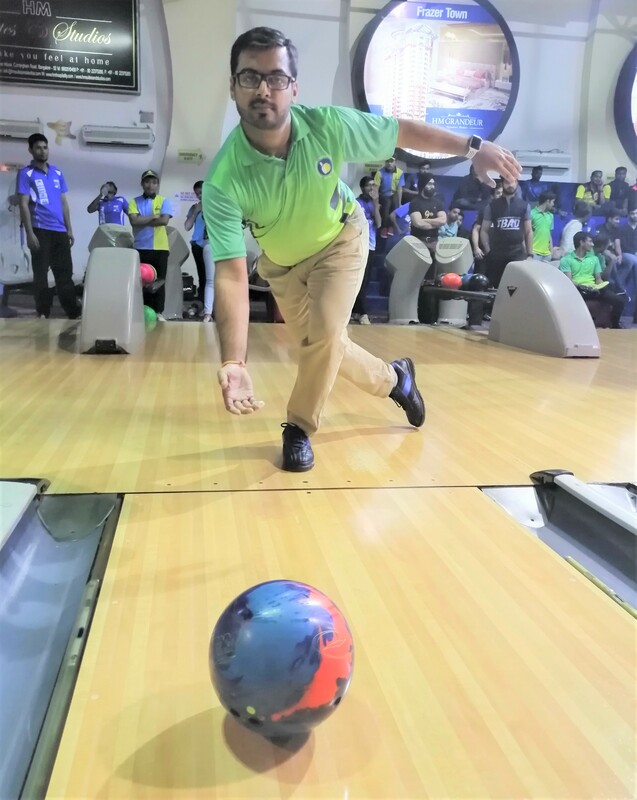 Elite squad members Parvez Ahmed and Akaash Ashok Kumar of Karnataka finished on top at the end of first two squads of Round 1 of Uniply 28th National Tenpin Bowling Championship, currently underway at Amoeba, Church Street, Bangalore. Playing on tougher Long oil conditions, Parvez started the day with a score of 170 in Game 1 followed it up with a 222 and 216 in Game 2 and Game 3. He opened three frames in Game 4 which resulted in low score of 176. He covered it up with two games of 200 in Game 5 and Game 6 and finishing the day with total pinfall of 1184 pins in 6 games. Akaash Ashok Kumar (1166) is in second position, trailing Parvez by 18 pins. Akaash started the day with 191 in Game 1 and followed it up with 202, 184 and 172 in Game 2, Game 3 and Game 4. He finished strongly scoring 200 and 217 in Game 5 and Game 6 and ended the day with total pinfall of 1166 pins in 6 games. Navneet Lahoti (1136) of West Bengal and Former National Champion Shabbir Dhankot (1128) of TamilNadu is in Third and Fourth positions respectively, after first block of six games. Defending Champion Dhruv Sarda of Delhi had a bad day in office with only two high games of 210 and 205 and rest of 4 games below 200, ending the day with total pinfall of 1084 pins. Four more Squads are yet to complete First Block of six games on Long oil conditions as part of Round 1.